1. Grease a 1-litre pudding basin with plenty of butter so the pudding turns out cleanly. Lay a sheet of tin foil just bigger than the basin on a work surface, then lay a sheet of baking parchment the same size over the top. Grease the paper and fold a pleat into the centre to allow the pudding room to expand. 2. In a stand mixer, or with a handheld electric whisk, beat the butter and sugar together until light and fluffy. Add the eggs and beat again, before adding all the dry ingredients and mixing to combine. Then pour in the milk and beat for a further minute before spooning into the pudding basin. Top with the foil and parchment, securing with string round the bowl. 3. Put the pudding into a large, deep pan and pour boiling water into the pan until it reaches halfway up the side of the basin. Cover with a lid, bring to the boil and then reduce the heat to a gentle simmer. Add more boiling water as necessary, to make sure the pan doesn’t boil dry during the cooking process. Steam for 1½ hours, or until the sponge is firm and well risen. 4. To make the sauce, put the mints and cream into a small pan over a low heat, stirring until the chocolates have melted and the sauce is smooth. 5. 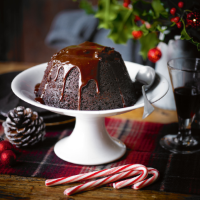 Tip the pudding onto a plate, pour the hot sauce over the top and decorate with candy canes or mint sweets before serving.